Children do free falls, somersault, chakrasana etc. with a lot of ease. They play outdoor games the whole day and still jump around when they reach home. Their energy levels are always on a high. As children our flexibility, agility, and stamina are good. Then they grow up to get busy building career and all the physical activities and outdoor sports take a backseat. Due to the lifestyle changes and choices that people make their stamina levels go down and the body starts becoming stiff and immobile. As you age, there are degenerative changes that occur in the muscles, joints, and bones. Due to lesser physical activity the muscles start becoming tighter and weaker thereby losing flexibility. This, in turn, affects the posture and gait, leading to weak and slow movements. The bone density mass decreases which might make an individual prone to fractures easily. The Synovial fluid between the joints decreases thereby leading to more friction and pain around joints leading to arthritis. As one age there is a drop in the basic metabolic rate which means that the amount of calorie burnt at rest is reduced. Exercise should be an integral part of one’s lifestyle across all age groups be it a child or Grandpa. The more the person is physically active throughout his life, the better will be his lifestyle as he would be more productive in his professional life as well as his personal life. Being physically active or working out in a gym not only increases your stamina and strength but also releases endorphins which are also called as happy hormones. Research has shown that individuals who work out often are less prone to psychological issues like depression and other lifestyle or hereditary diseases like diabetes, blood pressure, thyroid, polycystic ovarian disease and so on. 1. Children and teens (till 20 yrs) - These little bundles are immensely filled with energy. Children who are physically active are less prone to depression and can tackle issues with a positive attitude. Kids who play often are also known to have better grades in school due to increased concentration and focus. Exercise also improves interpersonal relationships in kids as it inculcates the feeling of sportsmanship in them. Exercise helps in improving the mood and self-esteem in children. Exercise helps in bone growth as well as developing strong bones. For children, it's all about fun and enjoyment. Get them enrolled in structured activities like football, basketball, swimming, martial arts, cricket etc. Such activities inculcate discipline in them. Kids love to have the feeling of independence and may want to do some things on their own, like designing a new game along with friends in the playground or simply riding a bicycle, encouraging them in such unstructured activities helps in inculcating in decision-making capabilities and self-confidence in children. Children’s bones are not fused; they have growth plates at the end of their long bones on either side. The growth plate fuses only during puberty hence it is very important not to strain or damage the growth plate in the years of their development. A high impact repetitious activity can lead to damage or strain to their growth plates. Avoid heavy weight training, though a child can do moderate weight training. 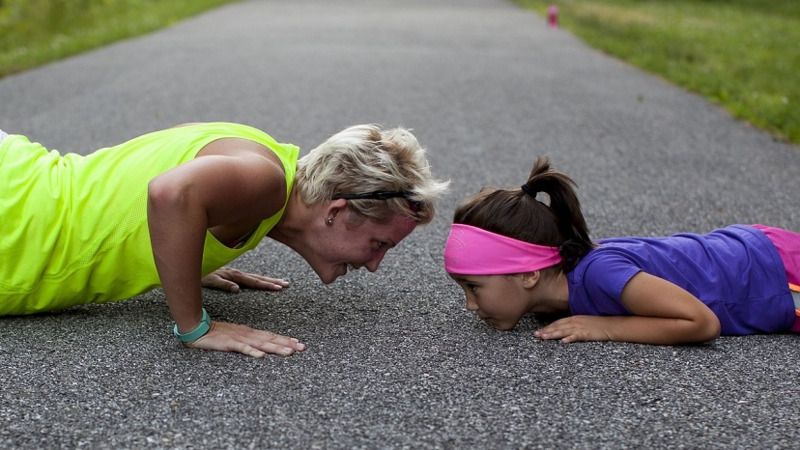 The best and the most effective way to train a child is by giving them bodyweight-based training. It is very important to have the right balance of micro and macronutrients in children as it affects their mental and physical development. Rather than relying on supplements, it’s always better to get the nutritional demand fulfilled by natural foods and healthy eating habits. However there is a high demand of protein in teenagers, we can give them protein supplement drinks which are available over the counter or take doctors opinion for the same. Individuals in this age group are either sitting for a long time or they are constantly on their feet. Adults between the age group of 20-30 yrs mainly want to work on their aesthetics and between the age group of 30 to 40 years want to work on their lifestyle and fitness levels. They need a goal which gives them a sense of achievement be it looking handsome or achieving half marathon in sub 2 timing. Adults are more prone to lifestyle disease like diabetes and blood pressure which occur due to wrong eating habits like stress eating, binging, comfort food options, weekend parties, too much of alcohol, skipping meals due to work commitments and so on. Changes in posture and gait ( walking ) due to loss of flexibility, muscle tightness and degenerative changes of joints and bones. When designing a workout program for this age group, I would give equal importance to strength training, mobility workouts, agility drills and endurance workout in form of sports or cardio. The goal is to work on all five parameters of fitness that is a strength, endurance, power, agility, and flexibility thereby improving the core strength which in turn strength which store and faster reflexes. While designing a program for adults, we will also have to take into consideration the fact that lead a very hectic lifestyle. In case if you’re not able to do one hour of workout every day then a high-intensity training of 20 to 30 minutes, 2-3 days a week followed one hour of workout for remaining 3 days will also have the same effect. Lifting heavy may make you look cool or give you a high, but it is equally important to know whether your body is ready for that heavyweight. One should always accept the strength of your body, your posture and how much you can push it without injuring yourself. Slow and sustained progression will lead to better results. Too much of anything is bad, so try to balance your workout and not focus either on too much of weight training or too much of running. Due to the hectic lifestyle if required Multivitamins and proteins supplements should be incorporated along with food. Regular health checkups every 6 months to one year is mandatory for this age group. Exercise prevents muscle loss or hypotrophy of muscles. While planning a program design for this age group, we should incorporate more of breathing exercises like Pranayam and chest expansion exercises. Doing yoga helps increase flexibility and joint mobility thereby reducing chances of injury.. Moderate strength training or body weight based strength training workouts like squats, push up etc helps increase the bone density mass of the individual. Outdoor activities like brisk walking and cycling help in increasing cardiovascular endurance. Activities like jumping and running or any high impact activity which has put pressure on knees on ankles should be avoided. Elderly people are more prone to slipping/falling, hence always wear comfortable footwear and avoid walking on places which potholes or uneven ground surface. If suffering from diabetes or Blood Pressure, special attention should be paid to pre-workout and post workout meals.